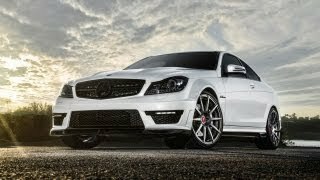 Vorsteiner’s new tuning aerodynamic kit has turned out to be a sensation in the automobile industry with the introduction of the 2012 Vorsteiner Mercedes Benz C63 AMG Coupe. The redesign by the tuners has taken the appearance of this German sedan to a whole new level. If we take a look at the front of the car, we’d find inclusions that have made the car look sporty, while keeping the famed Mercedes ‘luxury’ intact. While the bodystyle kit has been made of carbon-fiber to make the car lightweight, the front of the car includes bolt-on lower spoiler, badgeless front grille, front vent louver covers and a rear diffuser vent. Moreover, we’d find sporty four-silencer stainless steel or titanium exhaust system. The final touch to the exterior has been given by 19” or 20” forged aluminum wheels. The Mercedes badge has also been removed from the front. On the other hand, the tuning of the car promises interior featuring durable Vorsteiner-grade materials. While luxury is an indispensible part of Mercedes Benz cars, Vorsteiner also nullified some small glitches found in the earlier models. 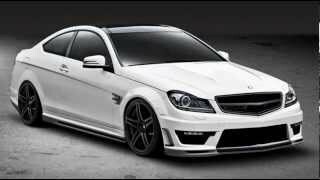 For example, in the 2012 Vorsteiner Mercedes Benz C63 AMG Coupe, the company included slip-resistant backing that provides firmness to the mat. Apart from these, the car has been made available in a wide range of border colors to meet the needs of customers’ personal choices. This sensational tuned German sedan is available in two different models - Base, and Black Series. 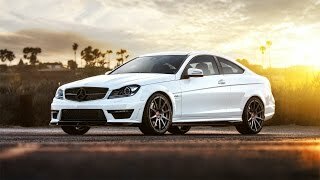 Finally, if we take a look at the engine specifications and the performance parameters of the car, we would find that this tuned Mercedes still runs on the older 6.3 liter V8 engine capable of giving an output of 451HP and a peak torque of 443 lb-ft. Although the company has not revealed any price info about the car, the tuning kits will be made available from this summer.